About ExeterViews.co.uk | "Guide to one of the best places in the UK"
The site was launched in the early part of 1999, and was originally based on a more personal view of the area. From this, with the help from some of its readers, ExeterViews has expanded and developed over the years. The pages within the site will hopefully provide almost all of the information any visitor should require to enable them to embark on a trip to the area. ExeterViews is also aimed at people simply wishing to learn about a place, perhaps on the other side of the world to where you are now! 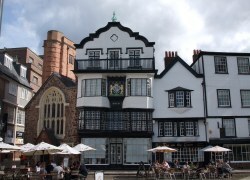 The objective of the ExeterViews.co.uk web site is to give an insight into the beautiful city of Exeter and the lovely surrounding countryside of Devon. Although the pages within the site are by no means comprehensive or precise, it does offer itself as a concise guide to start learning about the city. The pages will particularly appeal to visitors and tourists who wish to get to know the city more. The History page starts by giving a small account of the events that have taken place over the years starting with the Romans all the way back in 50AD on to our present day. 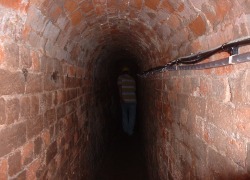 Some visitors to the site will be interested in what sights and attractions the area has to offer. This has been taken care of with the 'Places to See' and the 'Devon Attractions' sections, which provide details to some of the best on offer in the area. There's a 'What's On' section showing some of the events taking place throughout the year. The shopping page gives an idea of some of the best shopping areas within the city by listing some of the main shops and refreshment areas. And it's always a nice and valuable aid in planning a trip to see some photo shots of the area, so an expanding Exeter photograph gallery and several other pictures are available throughout. Further information is available through the many external links within the site. Although these links feature throughout, as they do on any information web site, there is a small collection available on the 'Links' page. This, again has been created to help maintain the purpose of trying to supply all the information that could possibly be required within the one site. 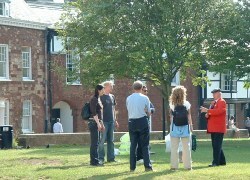 A greater source for local area links is within the Exeter Directory. An example of external resources being featured within a page is on the transport page. Here links are supplied for local and national transport providers. This section also provides maps and sketches to help determine travel routes. An evening entertainment / nightlife guide provides information and also lists some of the many clubs, pubs and restaurants available. One of the most popular sections viewed by visitors is the accommodation pages where some of the local accommodation providers are featured. Details on the page include - a photograph, description and contact details. So feel free to contact them for more information. Additional pages are planned for the future and others are being continually developed. So it's always helpful when the readers themselves provide some feedback, VIEWS and experiences of their trip. ExeterViews is read by people from all over the world, so help the site evolve and tell us all about it! Remember to Bookmark ExeterViews.co.uk now so that you can return in the future! If you have any ideas, suggestions, contributions or anything else - Something you don't like, a broken link - Please let us know! Maybe you have some great photographs you would like to see on-line. An old picture showing the city in earlier years or a lovely travel shot taken recently. Have you got a story to tell? Some views to share? What ever you have, show us and share it with the world!